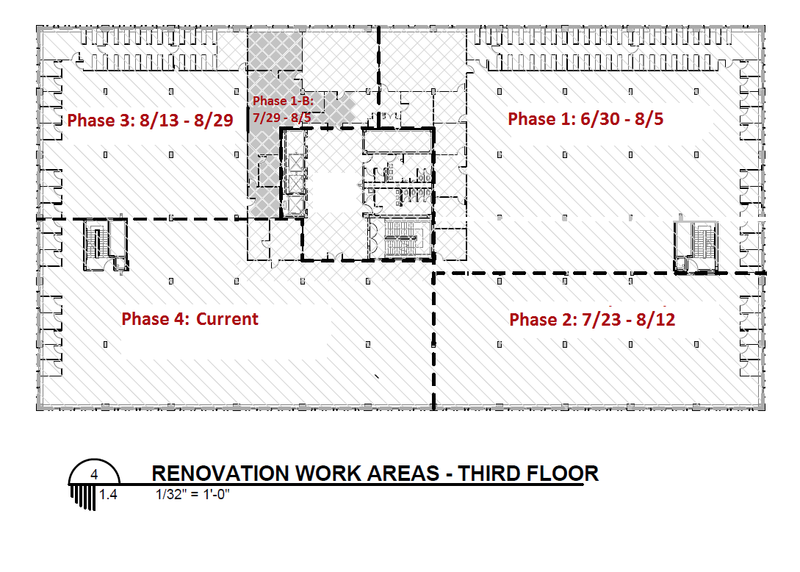 The subcontractor installing the fire suppression sprinkler system has moved on to the last quadrant zone on the 3rd floor which is labeled on our phasing floor plan as Phase 4. In doing so, plastic sheeting covering the book stacks in the Phase 3 area has been removed, with the exception of three remaining ranges where pipes and sprinkler heads have been installed and ceiling tiles are now being put back. Workers planned to finish with those tiles and begin moving the pipe cutting equipment out of the Phase 3 area this afternoon. The transition from one area to the next this time took place a full week ahead of schedule, which means the sprinkler installation work is now moving very fast and much faster than in any previous phase. There were still issues with clearly communicating that the crews would be making an early switch, and this will be addressed in construction meetings. However, having the work done a lot faster than expected is a better problem than what the library experienced with the same work on, say, its 4th floor, where long delays were the norm. After the work in Phase 4 on the 3rd floor is complete, the sprinkler system installation will move on to the 2nd floor, likely in just a couple of weeks. The library’s central stairwell has been reopened and is now accessible from its open 1st floor entrance and each of its access points on floors 2-4. In addition, the library’s middle elevator, which had been nonfunctional for the past couple of weeks, has been repaired so that all three elevators accessible from the building’s central lobbies are working, for the time being. The increasing need for elevator repairs has been due mostly to the advanced age of the elevators’ mechanical systems and controls rather than to the construction project, but we have begun arranging the repairs through the project until the elevators are upgraded to eventually serve the two more floors under construction. The elevators are more than 45 years old. Work to replace the old elevator mechanical systems, controls, and cables could begin, perhaps later this fall, soon after a new elevator “penthouse” is framed-in on top of the roof that is beginning to take shape over the library’s new 6th floor. The central stairwell had been closed since February in order to build one of four interior solid concrete “shear wall” supports that now connect to the frame for the library addition above. To help library users find materials in areas of the library stacks covered by protective sheets of plastic, Howard-Tilton's Center for Library User Education (CLUE) has opened a Construction Concierge Desk. The desk is presently on the 3rd floor where construction work is being done above the ceiling in phased quadrant zones. Around mid-September the work is expected to move to the 2nd floor and so will the desk and its in-person assistance. The desk will be staffed Monday through Friday, 10 am to 6 pm, and mostly by student employees. the CLUE staff has also placed signs on the floor that describe what students can do to get a book from an area covered by plastic sheeting outside the hours the desk is open. Crews are installing air duct and electrical conduit connections, then rebuilding firewall, above the ceiling and around the stairwell on the side of the building closest to Dixon Hall. The project is relatively minor in scale compared to the fire suppression sprinkler installation on each floor, but it does involve covering some books. Here is an overview of the project for the weeks ahead. On the 4th floor, the project has been completed above the ceiling in room 419 and about a week’s worth of work remains above the ceiling in the hallway outside. Nearby a half range of books is covered. These books have call numbers BC91 .B33 to BD241 .R457. On the 3rd floor, another week of work remains. One and a half ranges parallel to the stairwell are covered and these house books with call numbers HB846 .H53 to HC59.15 .E278. The ends of the some other nearby ranges perpendicular to the stairwell are also covered at present. The project has just begun on the 2nd floor and may take as long as two weeks there to complete. One and a half ranges parallel to the stairwell there are presently covered and these house books with call numbers PQ1917 .S43 . Z74 to PQ2191 .F63 .Z56. The ends of the some other nearby ranges perpendicular to the stairwell are also covered at present. 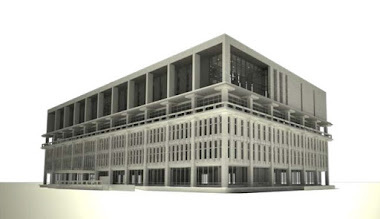 Eventually the project will move to the 1st floor as well, perhaps beginning next week. The library’s central stairwell will very likely be reopened soon and within the next couple of weeks, maybe not in the sequence originally planned, but reopened nonetheless. 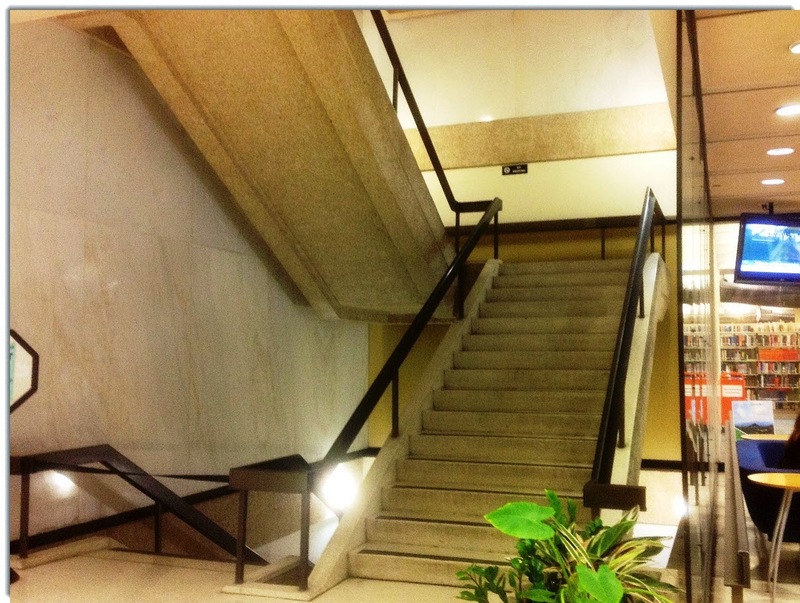 Also, the marble that was temporarily removed within the stairwell on floors 3-4 was successfully reinstalled without damage, following demolition of one of the stairwell’s interior cinder block walls and its replacement with a solid concrete slab “shear wall” support connecting to the upper frame for the library’s two more floors. The central stairwell was closed back in February and was indeed scheduled to reopen tomorrow on August 15, but at the time it was expected that the stairwell would be connected to a fully enclosed, although unfinished, addition above. Those same planned conditions are today probably still a few months away due to a combination of interior and exterior project delays, one of which is that steel for the upper frame hasn’t been arriving on schedule lately and this has a snowball effect in pushing back separately scheduled concrete pours and other work above. So over the past couple of weeks project managers and the construction contractor have cooperated to work out a plan to reopen the central stairwell regardless. Basically, they have built a temporary solid, framed wood floor over the stairwell at the 5th floor level. Workers have already pulled up most of the plywood planking that had been laid to protect each stair and landing. This week only some minor finish work and cleaning within the stairwell remains, and this work is set to continue through this weekend. The stairs may be especially useful later this fall as the library heads into a difficult period expected to include phased removal of the ceilings in the elevator lobbies and the phased replacement of elevator mechanical systems, controls, and cables that will modernize and extend the elevators to serve the basement through the new 6th floor. While travel within the central stairwell, once reopened, should be relatively uninterrupted through the fall semester, crews will eventually need to replace its railings with higher ones that meet modern building codes and a fire code-required pressurized glass enclosure with doors at the entrance to the stairwell on the 1st floor will need to be installed, probably in the spring after all the ceiling abatement work is complete. Hence, the Freret and Dixon side stairwells will likely remain open for general use until the construction subsides. The interior shear wall support in the central stairwell was one of four successfully built for the project, but because of the marble and other structural conditions it was by far the most difficult. Meanwhile, on the 3rd floor the subcontractor installing the fire suppression sprinkler system has moved on schedule to the Phase 3 zone in the southwest quadrant of the floor that includes the stacks area with M-L call numbers. The transition in moving from Phase 2 to Phase 3 had some bumps, with crews moving ahead to cover book ranges in in the Phase 3 zone several days ahead of schedule unannounced. This and some other problems, such as a few missed areas within the zones worked in thus far, are related to the much larger number of workers the subcontractor has brought in to handle the shorter time frames planned for each phase. The subcontractor has promised to do a better job of both balancing the work and keeping its crews reigned in. As the work progresses across the floor its “machine shop” with pipe cutting equipment is being moved as well, to the Freret St side of the floor. The sprinkler subcontractor has been told to enclose the pipe-cutting area in its next location with plastic sheeting (so it will not be as visible) and to keep a clear path for the stairwell nearby.